D. 9/10 2011 bestod Kochiz From Royal Breed sin UHM. On CACIB show in Bjerringbro, DK on 18/9 2011, Xulu vom Herrenholz was V1 with CK in working class, CAC, CACIB and BOB. 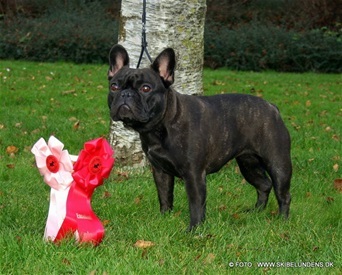 On show in Bøsøre(Denmark) on 4/6 2011 Radeau Ariel was V2 with CK in intermediaclass and 4th best female on show. VV1 in puppy class, BOB and BIG4!!!! Radeau Azia fik V4(EXC4) i juniorklassen på Bundessieger udstillingen i Dortmund, Tyskland. D. 15/10 2010. Dommer: Jutta Gerwert, D.
EXC1 og BHK2(2. bedste han på udstillingen) kun 10 mdr gammel.